Offer applies to the purchase and installation of a tankless water heater. Nothing wipes away your smile faster than coming home from a fun evening out or a weekend away only to discover your house is flooded! As you struggle to walk through the water to locate the source of the leak some of the questions running through your mind are "Why me? ", "What did I do to deserve this? ", "How much is this going to cost to fix?" As if things couldn’t get any worse, you notice that your water heater has sprung a leak! You might be left with potential water damage, an empty wallet and a huge headache. You're going to have to face trying to decide the type of water heater to buy. It may seem pretty straightforward until you realize there are numerous models available in the market. You must have a clear understanding of what you need in order to make the best choice for your home. For a start, you need to find out if your current unit can be fixed without the need to purchase another. To get the most for your money, set a yearly price limit of $50 or less on the warranty. Anything above that amount and you are better off buying a new one. Let's take a look at a few things you need to take into consideration when shopping for a new water heater. One obvious consideration would be whether to get a gas or an electric unit. Each of these has several sub-types including solar, tankless, hybrid, and the traditional storage tank heater. In the long run a gas heater is much less expensive than electricity. However, you may choose a tankless water heater installation if you currently have a traditional storage tank model. On the other hand, if your plan is to stick to the storage tank type, be sure to remember the old saying "you get what you pay for." The thing about these traditional units is they are not really worth the stress; the more expensive heaters are worth the extra cost. This is great if your home is situated in a very sunny region or if your tank can be directly exposed to sunlight. After you have decided on the type of heater you want, the next thing is to think about the capacity. The number of people living in your home and their personal showering habits will have a great impact on the size of heater. Take for instance you have two people in your home who take very long showers. They may use more water than four other people who take short ones. Consult with your plumber about the most suitable unit size for the number of people in the house. Other considerations to factor in include the type of warranty offered, the safety measures and digital displays. Tankless water heaters, as the name implies, do not come with any tank for water storage. They provide hot water when needed hence it's also called "demand-type or instantaneous heaters." These are high-power heaters which heats up water instantly as it flows. They supply hot water continuously and do not retain any as the tankless units have no storage tank. Point -of-use: These types of heaters are mounted at specific locations to cater for the needs. Whole house: This type of heater caters to the needs of the entire house. Electric tankless heaters: These heaters depend on electricity as their source of power. Natural gas or Propane-based models: They supply hot water using gas as their source. At the initial stage, the cost of a tankless water heater is higher compared to a traditional water heater. 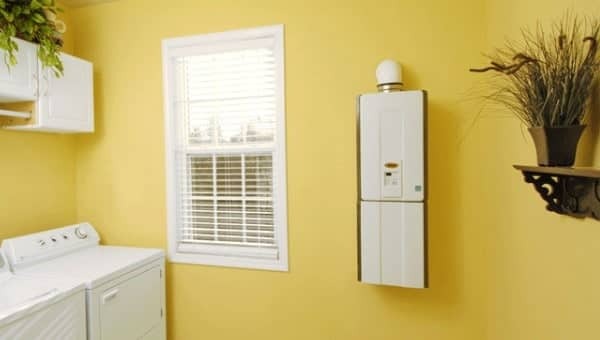 However, the tankless water heaters last longer and have lower operating costs, which could offset its higher purchasing cost. It costs about $2,500 for a basic tankless water heater installation but most of them have a life expectancy of 20 years and more. On average, it costs about $165 to $170 annually to operate a tankless water heater which is almost half the cost for a traditional storage. Flushing is part of the regular maintenance of a tankless water heater. It involves circulating distilled white vinegar through the heat exchanger using a submersible pump and an isolator valve kit.